You don’t have to be Irish to enjoy this St. Patrick’s Day celebration! Who? 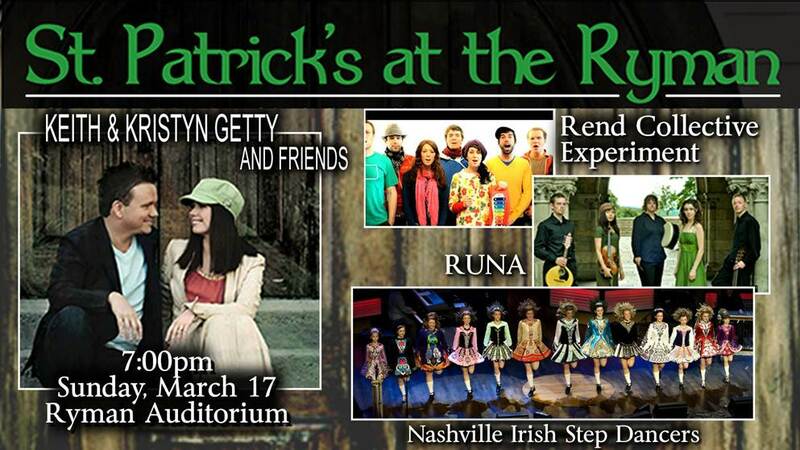 Keith & Kristyn Getty with special guests Runa, Rend Collective Experiment and the Nashville Irish Step Dancers! Where? Nashville’s historic Ryman Auditorium. Why? To be inspired, worship, have fun and enjoy a great night out with your friends. Fellowship Women has access a FLAT NO FEE group rate of $20 (Floor) and $25 (Balcony) tickets when we order as a group of 20 or more. Drop off a check to Anna at the Barn front desk anytime between now and Thursday at 4:00pm (made out to Fellowship) along with your Name, Phone Number, Which price of ticket you’d like ($20 or $25) and How many seats. FRIDAY NOVEMBER 2 7pm Storytelling Night! Daddy Daughter Dance Sept 14!